Because we have been around since schools and other educational establishments started to take fundraising seriously in the 1960s we have seen it all – literally. We know what works and what doesn’t. We know which perpetuated myths are nonsensical. And we know how schools can structure and manage their fundraising to best effect, whilst complying with increasingly stringent regulation. The Pocklington Campaign for an Art and Design Centre is an excellent example of how a relatively small independent school, strongly rooted in its local community, can raise a substantial capital sum to enable a major development which otherwise could not have happened, whilst also celebrating a major anniversary (its Quincentenary) through which it was able substantially to strengthen school and relationships. As planned, the campaign was effectively put on hold during the celebratory year, 2014, in order not to detract from the celebrations and recommenced in 2015, with the public phase of the campaign launching in April. At the time of writing it has now raised £1.8 million. Marymount is an international Catholic boarding and day school for girls with some 260 pupils. Established in 1955 by the Religious of the Sacred Heart of Mary (RSHM), the School moved to a lay Board of Governors in 2008. Led by a lay Head, but adhering closely to the ethos and values of the RSHM the school recently finalised a strategic masterplan identifying the development priorities for the school over the next 10-15 years. The priority was identified as a new Performing Arts Centre which is the focus of the Marymount Campaign. The nature of the School suggested that, even more so than at other schools, the emphasis needed to be on major gifts – a strategy that has inevitably proved time-consuming (given the lead time involved in arranging meetings with well-disposed but exceptionally busy people) but is proving highly effective. The campaign is well past its first interim target of £1 million and is now focused on reaching the £2 million mark. 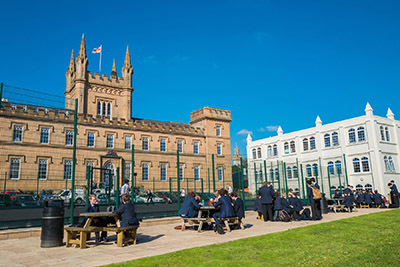 Craigmyle Consultants first worked with Elizabeth College in 2006-7 advising on the creation of their Foundation assisting with the first development appeal which yielded £1.52m. We then assisted with the inauguration of a legacy programme within the creation of The Dead Donkey Legacy Club, which so far has yielded just over £1million worth of legacies actually received and promises of much more to come over future years. In 2011-12 we assisted with the 450th Anniversary Appeal which yielded a further £1.68m. At the start of 2018 we began advising on preparations for the next capital fundraising appeal. The College’s policy of periodic fundraising initiatives separated by quiet periods of cultivating goodwill has produced a satisfactory return on expenditure and contentment within Elizabethans, past and present, with the Foundation’s activities. Craigmyle Consultants have worked with King’s Chester in the past in 1977,1986 and 1998. We are therefore delighted to be working with King’s again since the start of 2018. The School has ambitious plans to meaningfully increase endowment funds to support expanded bursary provision. Our principal focus is supporting the major gift activity crucial to all fundraising and essential to the achievement of substantial targets. We are also advising on further legacy programme development.